TRUSTWIGS, as a large wigs exporter in China, Our Main products include: full lace wigs, lace front wigs, glueless lace wigs, virgin hair lace wigs, silky top ( hidden knots) lace wigs, lace frontals & closures, hair wefts & extensions etc. We provide highest quality and service, our units are made from 100% Indian Remy, Chinese Remy, Indian Virgin, Chinese Virgin, Brazilian Virgin, Malaysian Virgin and Mongolian Virgin Human Hair in the wig industry. We have over 400 regional Distributors in United States, Canada, France, UK, Germany, Belgium, Netherlands, South Africa, Kenya, Nigeria, Australia, Brazil etc. and now helping more new clients enter into this field to earn more wigs buyers! If you want to become a successful lace wigs seller, join us to expand your market! We have more than 5000 lace wigs in stock for immediate delivery. The customers from US, UK, Canada and Asian countries can receive stock wigs in 2-3 work days! The customers from France, Belgium, European, Africa and other countries and areas can receive the stock wigs in 3-5 work days. Our products will practically sell themselves well and your potential for success is high, because your venue is broad, being able to market these units to your current clientele and their referrals. 1.Wholesale Discount: we provide different discounts according to the total orders amount . 2.Stock List Sharing: We are glad to share our stock lists with you, please email us or download the lists on wholesale area. 3.OEM Service: We provide OEM service to our wholesale customers. we produce products with your company’s mark or logo.That mean you can build your own brand without extra cost. Step 2: After receiving the payment, you submit the order to TRUSTWIGS.LLC. 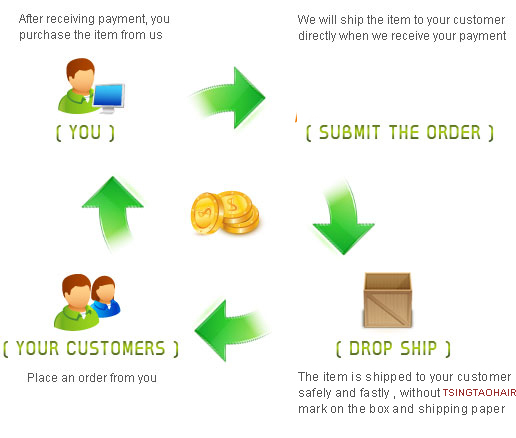 TRUSTWIGS.LLC allows drop-shiping orders for all registered customers. We do not include TRUSTWIGS.LLC publicity materials / invoices etc when we send drop ship goods, so it protects your reputation as a seller.